FIRST POST – March 21, 2012 – RUSSIA’S SERGEI LAVROV NOW BASKS IN THE GREATEST DIPLOMATIC ACHIEVEMENT IN MODERN RUSSIAN HISTORY. Yesterday, Sergei Lavrov, criticized the Syrian government’s response to the first manifestations of dissent in the country, essentially labeling them “crude”, “misguided” and “erroneous”. Mr. Lavrov could never do this while Russia perceived the situation in Syria as threatening to her ally, Dr. Bashar Al-Assad. The trade-off now for all that support and success is Syrian acquiescence to a Russian campaign to demonstrate the Kremlin’s sincerity in trying to resolve the crisis in Syria peacefully. The Russian gambit has been literally, brilliant. Lavrov’s move now to isolate the West by acting as the true proponent of peaceful negotiation maybe an historical masterstroke no less resplendent than Kissinger’s disengagement from Vietnam. Russia’s triumph is now at an historical watershed. We don’t know if Mr. Lavrov plays chess. He has all the qualities of a master: calm, an organized mind and a deliciously phlegmatic type of cunning. Kofi Annan’s mission has played right into the hands of the Kremlin. Now that the military opposition has been extirpated from Homs with rag-tag bands of ineffective, directionless deserters trying to find a graceful way back into the society they betrayed, Russia can welcome the very “objective” Annan into the mixture. Annan had impressed the Russians when he was Secretary General by declaring the American and British invasion of Iraq as “illegal” under international law. They clearly sense that his mission will work out well for both the Syrian government and Russian policy. Annan already has seen what the Russian diplomats have been describing as the opposition’s intransigence and brutality. Russia’s call for both sides to cease acts of violence has found a positive reverberation in Annan’s new plan to bring the Syrian crisis to an end. 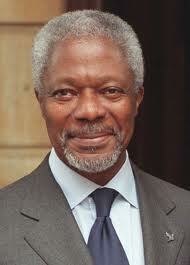 Annan, a Ghanaian by birth, is highly respected for his integrity. He will not please the Syrian exile dissidents. With the U.S. increasingly drawing back on the Syrian issue and both Sarkozy and Cameron licking their wounds after a near collapse of their entire foreign policy in the region, Russia has moved in with the grace of a giant Kodiak bear prepared to swallow everything in its path. When we called the arrival of the Soviet fleet into Tartous as ‘Checkmate”, we at SyrPer had no idea that the real endgame was still to be played out and won in the diplomatic arena. BRAVO, MR. LAVROV!